﻿﻿ The handcrafting and meticulous design of Nancy Gonzalez's line ensures that every piece is a unique piece of art. Her focus is always on the materials, and her accessories are never fussy, over-designed, or trendy. 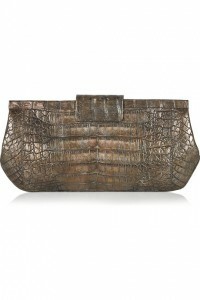 This small crocodile clutch is a fabulous addition to the collection. The bronze treatment on the crocodile skin is breathtaking. Gonzalez uses color here with a masterfully light touch. The croc skin takes this enhancement very well, and, and even though it is shimmery and metallic, it still looks amazingly organic. It's the shape of this bag that really pulls it all together, though. The cut-off corners give the clutch a hexagonal shape that mimics the scales on the croc leather. This draws extra attention to the exotic material, and gives it that little je ne sais quoi. At $925, this small clutch isn't cheap, but it's in a reasonable range for a bag of its quality and caliber.